Delivering incredible full-range sound via the signature Beats Acoustic Engine, Beats headphones are a multi-award-winning selection of over-ear, in-ear and wireless headphones designed to reproduce the full spectrum of sound that musical artists and producers hear in professional recording studios. 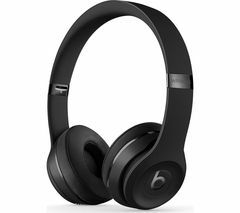 Also known as Beats by Dr. Dre Headphones, the legendary hip-hop artist-turned-producer who developed the Beats sound, the brand includes a variety of headphones and earbuds that boast superior sound. 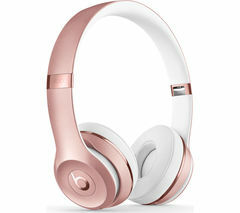 The wireless Beats headphones range includes Solo 2 and noise-cancelling Studio over-ear headphones, as well as Powerbeats earbuds. Compatible with all smartphones, Wireless Beats headphones can pair and play with any Bluetooth device, enabling you to hook up with your favourite tracks and playlists wherever you go. With no wires to worry about, they’re ideal for travel, sport and life on the move. Choose from a range of colours and finishes to suit your look and adjustable for a customised fit. You can pair and play with Bluetooth devices within a 30-foot to 9-metre range, and enjoy the iconic Beats Acoustic Engine sound that lets you hear what the artists hear. No-slip-grip RemoteTalk controls make it easy to take hands-free calls, chat online, skip tracks and adjust volume as you go. Check your battery levels instantly with Fuel Gauge, and make the most of 6-12 hours wireless battery life depending on the headphones you choose. Need a quick power boost? With Fast Fuel, a 10-minute charge gives 3 hours of play when your battery is low. For the commute, sport or at-home listening, Beats by Dre headphones give you pro-level studio sound wherever you go. For a wider range of premium in-ear and over-ear headphones, take a look at our Bose, Apple headphones, Sony headphonesand the latest Sennheisers.